indicators for World regions, China and India with the line to the 2015 MDG targets? We are using data from the UN, The Millennium Development Report 2012, New York, July 2012 and present the MDG implementation in the time distance perspective. The MDG 2012 Progress Chart (United Nations 2012) gives a quick assessment over 16 selected key targets, as it can deal also with qualitative judgments. For a more restricted number of 10 selected indicators for which numerical estimates are available we complement the UN Progress Chart with Time Distance Progress Chart of monitoring the progress of implementation. Time distance is first and foremost important as an innovative concept of looking at data in a novel complementary and intuitively understandable way. The application to monitoring is easy to understand and to communicate; it is like comparing actual arrivals with the train (airplane, bus) timetable. 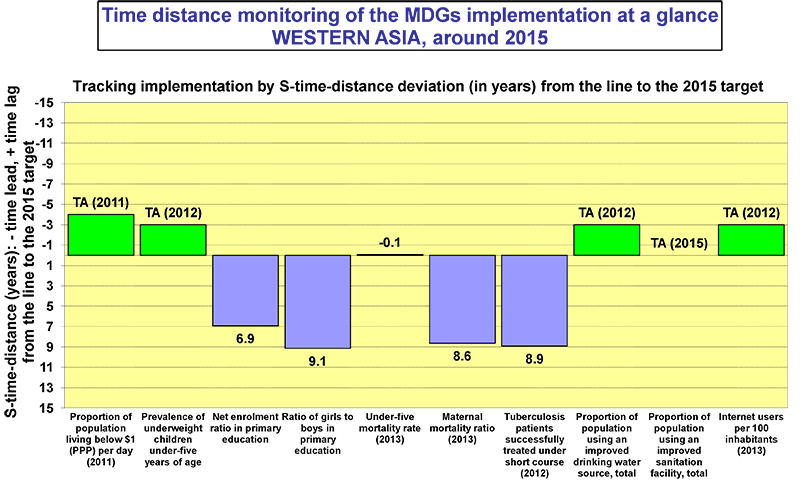 S-time-distance measures deviation in time showing whether the actual developments are ahead or behind in time from path to the 2015 MDG targets (+ time lag, - time lead). Are we ahead or behind in time comparing with the line to the 2015 MDG targets? The table below examines the situation in more details for Developing Regions, 7 world regions, China, and India. The situation differs among the world regions, but the overall situation shows that for about 26% of cases of 10 selected indicators from all 8 MDG areas the 2015 targets were already achieved, for another 24% of cases the actual developments were ahead of the line to the 2015 targets. From about one half of the cases that were lagging behind about 17% were lagging more than 6 years, especially in Sub-Saharan Africa. China as the most populated country shows excellent results, for six out of ten indicators it already reached their 2015 MDG targets. For each of the analysed units graphical presentation of MDG implementation are provided in the PowerPoint file below. The table above also allows comparisons of implementation across indicators and regions at a glance. From the health domain the three selected indicators stand out as the cases where the MDG targets (with one exception) have not been achieved in any of the world regions. This is true also for the net enrolment ratio in the primary education where the target of full enrolment was set too high in view of the starting positions. It should be reasonably easy to incorporate the S-time-distance methodology for monitoring implementation of the MDGs in the work of the UN, the World Bank and other agencies or countries on these issues, both at macro and at micro levels. SICENTER developed a free web tool to facilitate this for interested users that can be accessed at http://www.gaptimer.eu/s-t-d_monitoring_tool.html.